WEEK 1 : February 3-9 Each day we will give away 50 small pepperoni deep dish pizzas to the first 50 customers. NO minimum purchase. 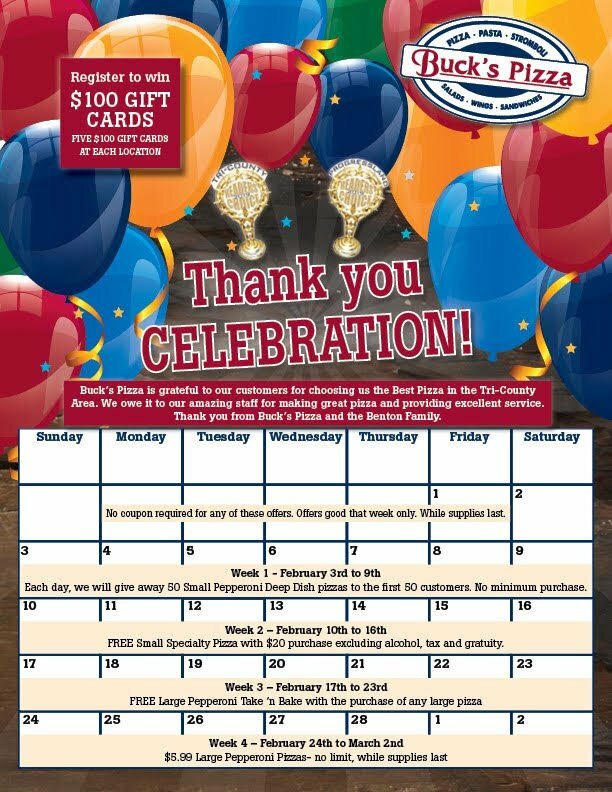 WEEK 2: February 10 - 16 Free small specialty pizza with $20 purchase (excluding alcohol, tax and gratuity. WEEK 3: February 17-23 Free Large pepperoni Take 'n Bake with the purchase of any large pizza. WEEK 4: February 24 - March 2 $5.99 Large Pepperoni Pizza' NO LIMIT , while supplies last.